The Center aids in recovery efforts after the tragedy at First Baptist Church. Sunday, November 5 marked a horrific day for Sutherland Springs, Texas and the surrounding communities. Over 25 individuals were killed or injured in the shooting at First Baptist Church, and countless lives were affected. Since that day, The Center has been on-site 24/7 to provide counseling services to those in need. There are also plans to open another new satellite location in La Vernia, Texas. If you or someone you know was affected by the Sutherland Springs shooting, you are welcome to come to one of the many courses we will be offering in the area. GRIEF Share is a 13-week course that will cover the physical, emotional, spiritual and social implications of grief, the grieving process, and how we can use memories to heal. Grief and the Holidays is a course that aims to help individuals get through the most difficult times after the loss of a loved one. 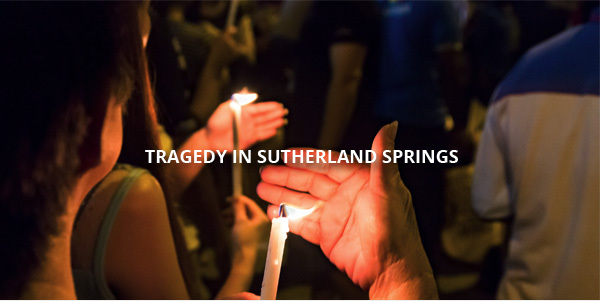 Share the post "Tragedy in Sutherland Springs"